What is Ylang-Ylang Oil ? Ylang ylang oil is pale yellow in color and has an rich, exotic fragrance that is alluring and sensual. It is one of the more complex scents, a harmonious combination of intense, sweet jasmine-like floral, a hint of spice, and a soft creamy overtone. The oil is steam distilled from flowers that are picked from the cananga tree in the early morning. The distillation process for ylang ylang differs from most other oils since it is interrupted at various points while the oil is removed, and these stages determine the quality it is graded by. The first oil to be drawn is graded Extra or #1 and is the highest quality. It blends well with clary sage, ginger, lemongrass, jasmine, palmarosa, patchouli, rose, vetiver, sandalwood, bergamot, orange, chamomile, petitgrain, and clove. Ylang ylang is certainly an enticing scent to include in a massage oil. Blend it with lemongrass and another aphrodisiac such as Sandalwood, and you have quite a romantic blend. 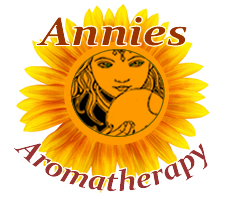 Even for those times when I want to relax and enjoy a spirit altering fragrance in an aroma lamp, I often reach for this lovely oil. Just keep in mind that it does not take much, as it is potent. High concentration can cause headache and nausea. Avoid while pregnant or breast-feeding. Beware of adulterations with inferior oils. Botanical Information - Rituals & History : The native Filipino cananga tree, found throughout tropical Asia, produces the perfumed, curly flowers that yield the highly fragrant ylang ylang essential oil. 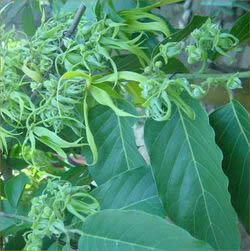 It has long, smooth glossy leaves and its branches droop similar to a willow tree.